2007 has been a banner year for CD purchasing for me so far. I swear, I haven’t bought this many CDs in such a short period of time since I worked at a music store — and back then I had the excuse of a 30% employee discount to blame for my constant music purchases (in addition to the free promo CD giveaways that often resulted in me getting such awesome CDs as Cracking Coals and The Family Circus Teaches You German). Now? Well, I’ve gone a bit nuts indulging in Japanese pop and rock music, since there’s lot of good stuff to be had there. Anyway, since nothing will help you know what’s good and what’s not more than some bozo on the internet spouting off ill-informed opinions, I’ve decided to list off most of the CDs I’ve bought this year, with some impressions (mostly for the sake of my friends, who sometimes go for this type of thing). Either way, this probably won’t be of much interest to anyone, really. Tori Amos, American Doll Posse — Tori Amos is back, and she doesn’t like George W. Bush. For me, protest songs usually bite hard because the singer is more concerned with getting his or her message across instead of writing a good song. Luckily, the music on this album is good, if a little more radio-oriented than most of Tori’s stuff. Plus, most of her lyrics are so incomprehensible that you often have no idea what she’s singing about anyway, unless you really listen. And besides, it’s not all Bush-bashing, which would get tiresome pretty quickly. As with most of Tori’s recent CDs, she definitely gives you a bang for your buck, with 24 tracks taking up almost all 80 minutes available on the CD, plus an extra song on the bonus DVD if you purchased the special edition. I don’t really get into the multiple personality concept/dress up she presents on the album (very similar to what she did with her covers CD, Strange Little Girls, several years back), but it’s not like it affects the album in any tangible way. browny circus, Looking for the Summer and Surf Trip! — Ah, Japanese surf rock. 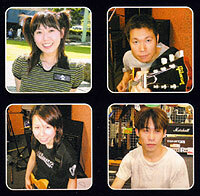 I first discovered this band because their song “Time Machine ni Onegai” is featured in the film Shimotsuma Monogatari (released as Kamikaze Girls in the U.S.) and I really liked it. So, for my birthday Chief Oddball get me the two browny circus mini-albums available through CDJapan. They’re interesting, to say the least; the songs aren’t surf rock in the traditional Beach Boys/Jan & Dean sense — it’s more heavy guitar rock with lyrics about surfing and summertime, with backing vocals that somewhat resemble surf rock harmonies in places. Oh, and the lyrics are all in English…and sometimes a little incomprehensible — thank goodness for lyric sheets! Both albums are really short — both are about 20 minutes apiece, and most of the songs barely break the two-minute barrier. Despite all that, the albums are entertaining to listen to, and oddly charming. The only major drawbacks are in the mixing of both albums — much of the time lead vocalist (and songwriter) Kaori is nearly buried beneath the loud guitars. Worse, “Time Machine ni Onegai” (which appears almost as an afterthought on Surf Trip!) is remixed, with lots of reverb — and some vocoder effects — added to the track, which makes it a bit less appealing than the version on the Shimotsuma Monogatari soundtrack. Kaela Kimura, Kaela, Circle and Scratch — Reaper got me these three albums for my birthday, and I liked them so much that I ended up purchasing all of Kaela’s singles not too long afterward. She’s somewhat similar to Puffy, in that most of her tracks are mostly classic pop/rock sounding, though a few synthesizer-dominated pop songs end up on each of her albums. Although, Kaela’s stuff doesn’t often have the same authentic, retro-’60s rock vibe that Puffy’s work does. My favorite of the three is Scratch, her latest album, but all three are awesome. Perhaps I’m just easy to please. And, even though Scratch was released just this past February, Kaela’s already got a new single coming out next month. Is this what buying records was like in America in the 1960s? 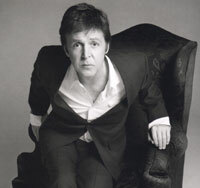 Paul McCartney, Memory Almost Full — Paul’s got a new album out, and it’s on the record label owned by Starbucks! Woo! Seriously. Anyway, I’d read that this album supposedly sounded a bit like Wings, which intrigued me — I like Wings, after all. However, upon a few listenings, I’d have to say that the album sounds more like Paul’s early ’80s output like Tug of War than anything Wings ever did (even though Tug of War could be called a more-or-less Wings album and…oh God, I’m going a bit off track here so I’ll shut up on this point now). There’s not a whole lot of rock and roll to be found, and the production at times tries to sound too up-to-date — this is possibly the fault of producer and co-mixer David Kahne, who also produced such rock luminaries as Sugar Ray in the past. Kahne also produced Paul’s Driving Rain in 2001, an album which I thought wasn’t among his best (and which, at times, sounded like it was trying too hard to sound contemporary as well). I picked up the special two-disc edition of Memory Almost Full that a) comes with a bonus CD including three bonus tracks and an audio interview, and b) has the most convoluted packaging of any CD I’ve ever owned — the package has five flaps, four of which must be opened to get at the discs themselves. I don’t think this CD is as good as Paul’s last album, Chaos and Creation in the Backyard (which was supposedly recorded after Paul started recording Memory Almost Full), but it’s got some pretty good stuff on it anyway. Let’s put it this way — it’s nowhere near as schlocky and unbearable as Pipes of Peace or Press to Play. Pink Lady, Best Hits Album — Good old fashioned 1970s Japanese pop. Pink Lady were a huge success for about three years in the late ’70s — success that they attempted to replicate in the U.S., to mixed results. Their generic disco single “Kiss in the Dark” remains the last song by a Japanese act to hit the Top 40 in America, though nowadays Pink Lady are more remembered for their historically awful variety show that aired on NBC for a few months in 1980. But beyond that, this two-disc set (filled with all of Pink Lady’s A-sides from 1976 through 1981) is solidly entertaining. The first disc contains the track listing of the original Best Hits Album as released in 1976, while the second disc has the remaining singles Pink Lady released until they broke up in the early ’80s. Some of the songs are pretty goofy — such as the Japanese-language covers of stuff like “In the Navy” and the theme from “Fame” (both with new lyrics) — but a whole lot more of the record is actually pretty good. There’s nothing deep or profound here, just mindless fun. Puffy, Hit & Fun — I’ve written rather extensively about Puffy on this site in the past — which is natural, I suppose, seeing as the duo is my favorite Japanese musical act. This disc is their most recent “best of” release, with a track listing that was (supposedly) voted on by an online poll. Of course, nothing I voted for got on, since I didn’t vote for any of the popular hits (I’m such an iconoclast…). The disc focuses more on Puffy recent stuff (including all of their 2006 singles, plus one new tune), but plenty of old favorites are included as well. The limited edition (which I have, naturally) comes with a bonus 8-cm disc, with English langauge tracks that were initially released only on the U.S. version of Splurge, Puffy’s album from last summer. Interestingly, the tracks aren’t quite the same, with some remixing and re-arranging done, making them somewhat unique in their own right. Better yet (for me), Puffy are releasing a new single next month, which hopefully means a new studio album will be released before the end of the year (and in my dream world, a U.S. tour would follow). Ringo Shiina, Shouso Strip — I’d read a lot of good things about Ringo Shiina online, in addition to the fact she’s apparently a fan and critical favorite in Japan. So I picked up this album — her second, and according to several places a good “jumping in” point in her catalogue (which includes five or six regular albums and a boatload of singles and tribute appearances — and that’s not even counting the large number of discs she’s cut with the band Tokyo Jihen). While a lot of the album rocks out well enough, I just can’t get into it that much. I feel bad for not getting into this like I perhaps feel I should — after all, a rocking female Japanese singer/songwriter/producer would seem to be right up my alley. Yet it isn’t. Strange how that works sometimes. Also: Ringo really likes to roll her r’s. Seriously. That old “R-R-R-R-R-R-Ruffles have R-R-R-R-R-R-Ridges” commercial compaign has nothing on R-R-R-R-R-R-R-R-R-Ringo Shiina. Shimotsuma Monogatari Original Soundtrack — Earlier this year (as documented in one of my older posts), I bought this movie on a whim, and ended up loving it — perhaps more than I should have. In addition to loving the movie was too much, I became enamored with its soundtrack, which was mostly composed by super-soundtrack composer Yoko Kanno. I also fell in love with the pop songs on the soundtrack, from such artists as Tommy Heavenly6, browny circus and Cecil. Thus, I ordered the soundtrack almost immediately — the first true soundtrack CD I’d bought since probably the Sailor Moon soundtrack box sets I purchases several years back. It was worth it, though — this is an amazing soundtrack, even beyond the vocal tracks. I’m usually not one for movie scores, but most of the record is in a pop/rock vein, which probably makes it more palatable to my ears. Do note, though, that this disc contains exactly zero of Tommy Heavenly6’s contributions to the film’s soundtrack — but it does contain “Time Machine ni Onegai” by browny circus, which is as near a perfect song as you can get. Shonen Knife, Brand New Knife, Happy Hour, Heavy Songs, Candy Rock and Golden Best Universal Hits — Yes, I went a little nuts with the Shonen Knife CDs. But after my recent splurge, I now have most of SK’s regular albums, save for Rock Animals, which appears to be long out of print (plus I’ve got their upcoming album, fun fun fun, on preorder). I can’t help it, though; I love their stuff so much, and I’m the kind of person who — if I really like an artist — I try to get as much of their stuff as possible (which is why I have, for example, over two dozen Kinks CDs). For the most part the albums don’t expand much on the guitar/bass/drum formula Shonen Knife has relied on for over 25 years, but somehow I can listen to each album over and over and not be bored. The often goofy nature of the songs (many of which are about food) helps keep the mood light, as well. I really hope they come back to the U.S. to tour so I can see them, even though there’s only one original member still active in the band (that would be lead singer/guitarist/songwriter Naoko Yamano, for those of you keeping score). Shoko Suzuki, Shoko Suzuki Best Collection, Suzuki Shoko and SHO-CO-JOURNEY — I first became aware of Shoko Suzuki by checking the credits of my Puffy CDs and discovering that she’d written a handful of my favorite Puffy songs (and played a mean drum track on one song as well). Intrigued, I’ve been wanting to get some of her stuff for a while now — and for my birthday, Chief Oddball obliged. He got me Shoko Suzuki Best Collection, a greatest hits (duh) covering Shoko’s years recording for Epic records (1988-97). At first I was somewhat disappointed; I was expecting peppy pop rock like the stuff Ms. Suzuki had written for Puffy, but the first three or four tracks on the CD were ultra-soft rock (with one song even having a stereotypical lite-rock saxophone solo). Those songs still aren’t among my favorites, but I ended up really getting into over half of the album. It’s mostly poppier fare, but some of the songs are truly amazing. That led me to getting two more Shoko Suzuki albums. SHO-CO-JOURNEY just came out in Japan, and is actually another hits album — though thankfully, not much is repeated between the two hits discs I have, even though they mostly cover the same years in Shoko’s career. The real find, though, was Shoko’s 2006 self-titled album — seriously, the disc is amazing. It’s actually my current favorite album, one that I listen to nearly obsessively. It’s mostly piano-based pop (as in, piano and vocals only), but there are a handful of full-band tracks, and those are as amazing as anything I’ve heard lately (heck, the entire album is). I like to think of it as a heavier Carole King, or a less-eccentric Tori Amos (but even those comparisons are flawed). It may not be everyone’s cup of tea, but it is for me. I’d love to see her live someday. Until then, I may have to get a live DVD or two to get my fill. Sloan, Never Hear The End of It — Halifax, Nova Scotia’s gift to the rock world, Sloan released their first new album in over three years late last year in Canada, and earlier this year in the U.S.. I wasn’t too impressed with either of the band’s previous two albums — Pretty Together and Action Pact — but I love this album. It sound far more natural and less contrived than the previous aforementioned releases — it doesn’t sound like it’s trying to force itself onto hard rock radio like Action Pact did, at least. The album contains 30 tracks, many of which segue into each other — think of it as The Beatles meets Abbey Road in a sense. Some of the lyrics are inane (“Ill placed trust / Promises rust / Ill placed trust / Buried in dust” — you go, Patrick Pentland), but the sheer volume of songs — not to mention their quality — more than makes up for that little complaint. Tommy Heavenly6, Tommy Heavenly6 and HeavyStarryHeavenly — Another artist I heard on the Shimotsuma Monogatari soundtrack. 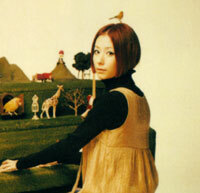 Her real name is Tomoko Kawase, and she apparently used to be the lead singer of a band called The Brilliant Green. Several years back she released her first solo project, titled Tommy February6 (after her birthday, I believe). I’ve never heard that stuff, but apparently it’s straight-up 1980s-style dance pop. A while after that, Ms. Kawase came up with another alter ego, Tommy Heavenly6, which is very rock-oriented; honestly, the first time I spun these albums, the first thought that popped into my head was “This sorta sounds like Avril Lavigne.” That may be a good thing or a bad thing, depending on your tastes. Once in awhile she switches gears — like “Hey My Friend,” the gorgeous closing theme from Shimotsuma Monogatari — but generally it’s straightforward rock. Oddly, on the most recent album — HeavyStarryHeavenly — there are two seasonal songs: the Christmas tune “I (Heart) X-Mas,” and a Halloween song entitled “Lollipop Candy Bad Girl.” I have the regular edition of Tommy Heavenly6 and the limited edition of HeavyStarryHeavenly; the latter comes with a bonus DVD containing six promo videos (and all of which are rather strange). This stuff isn’t awful by any means, but I have to be in the right mood to hear most of the songs. Oh well; they can’t all be amazing life changing experiences, right? YUKI, Wave — Another shot-in-the-dark purchase from CDJapan, but I like this album — from former Judy and Mary singer Yuki — much more than either Tommy Heavenly6 album. The songs on the record jump genres almost without abandon, which makes for an interesting listen — the first track sounds almost like a stereotypical anime opening (and it was, I think), while other songs span electronic dance pop, rock ballads, and regular pop rock. Heck, the intro to one song sounds quite like the intro to “I Talk to the Wind” by King Crimson (though the similarities end at that point). Yuki’s voice is certainly unique — it has an almost childlike quality to it, but it fits the songs perfectly. I’m very intrigued about getting her other albums; of course, like everyone else on this list (or so it seems), she’s about to release a new single, which means yet another album is right around the corner. Joy. More money I don’t have. That about wraps up this vapid, over-long post. Hopefully you found something worthwhile in it. If not…well, it’s a blog — need I say more? But who knows, maybe someone will find this stuff informative and find out about some really good music that they may not have known about otherwise. Or they’ll just close their browser window and find something more worthwhile — like The Picard Song! Man, I haven’t listened to that in a while. You’re welcome for the info! (Glad I could be of help to someone…) I mean, if you really like McCartney you’ll definitely get something out of it, even if it takes a few listens. It’s just that Paul has released so much quality stuff over the years (not even counting the music he released with those three other lads in the ’60s…) that, even if a disc (like this one) is pretty good, it still doesn’t necessarily rank with his best…and it’s that’s “best stuff” that I end up comparing each new album against (which probably isn’t entirely fair…). But a “pretty good” album from Paul McCartney is still light years ahead of a lot of other people’s best work. 65! Oh please don’t tell me Paul is 65! How time does fly. And you are absolutely right – even a mediocre album from a man with this much talent is definitely worth more than a listen. BTW, I’m interested to know what you think is his “best stuff”? Is it the “vintage” McCartney, or the 80’s McCartney? or what? What do I think is his best stuff? Wow, that could be a whole new post! 🙂 I guess I kind of agree with the general assessment I’ve seen elsewhere — he was really awesome in the ’70s (and 60s, but that goes without saying). He then hit a bit of a lull in the ’80s (the Michael Jackson years), then rebounded in the mid-90s and has remained pretty solid ever since. So yeah, I guess I feel his ’70s work is the absolute “best” outside of the Beatles. But that’s just the cream of the crop, though — generally, each album has at least one or two amazing songs, and usually more: “Maybe I’m Amazed” and “Teddy Boy” off of McCartney, “No More Lonely Nights” from Give My Regards to Broad Street, “Coming Up” from McCartney II, etc. Most of his mid-’80s stuff (Pipes of Peace & Press to Play specifically) doesn’t do too much for me, but I can get at least something out of all his other albums (except the classical stuff, which I haven’t heard much of, though I think I have Standing Stone on CD around here somewhere). Wow, that was long-winded. Hope you didn’t fall asleep reading all that! Nope, I’m still awake 🙂 ~ and I agree with your assessment. Most of the mid-80’s stuff I never even heard (guess I was too busy listening to all of Brian’s Sesame Street and Raffi recordings!) I loved Band on the Run and Red Rose Speedway – and Flaming Pie! I’d almost forgotten that one, and now I have to go look it up. 1976? That probably would have been the “Wings Over America” tour — man, that would have been awesome to see! I’ve seen Paul twice myself — in 1993 (this ended up being Linda’s last tour) and 2002 — but it still would have been nifty to see Wings in their prime (of course, I wasn’t even born yet, so that would have presented a bit of a problem!). A lot of Paul’s ’80s stuff suffers because he moved away from pop/rock to more squishy, over-produced lite-pop, and the results often sound very bland to my ears. But it’s been a very long time since I’ve pulled out some of those records, so my opinion might change if I tried listening to them now. But I don’t think it’s too shabby that, out of nearly 30 solo Paul records, there are only three or four that I really can’t get into. I like Paul McCartney too. Otherwise I listen Shiina Ringo’s songs. In Japan, she has both cool and indy kid credibility and is very popular. I definitely liked a few of the songs on my Ringo Shiina CD, but I just happen to prefer stuff like Puffy, Shoko Suzuki and Shonen Knife more. I may sample some more Ringo Shiina in the future — because I definitely like some songs I’ve heard — but it’s not a high priority right now.